My mother had chronic vitiligo where most parts were white with a few dark patches. I developed vitiligo at 23 after finding my toes burned in the sun. The skin specialist prescribed Trisoralen which kept it at bay for many years. Suggest you do not dye hair as peroxide damages skin and scalp causing white patches. 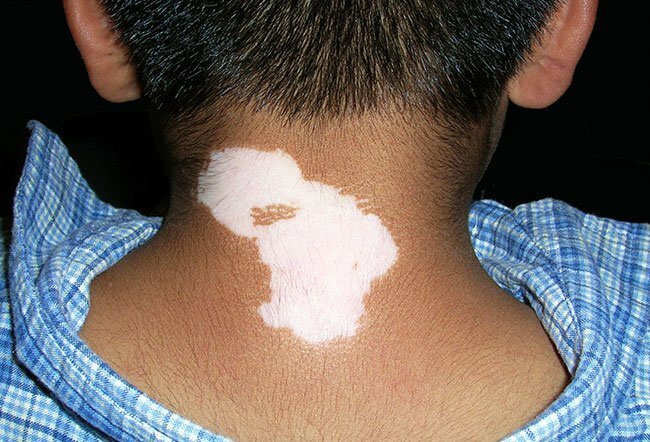 I have since discovered that that this condition was inherited from my maternal grandfather's side of family with all descendants having vitiligo to some degree. I honestly never knew what the condition was called until my mom's best friend who also happens to be a nurse pointed it out to me. I have not tried this yet, but I will very soon where for those who are continuing to look for a solution to help cure it, be aware of your nutrient levels and intake. I have had vitiligo and today (6/16/18) I just noticed that it had spread to the top back side of both my shoulders. Since it does have to do with melanin, I was curious to know if there were any foods that contained it, and this is what I found: 'Eat animal and plant-based foods that contain vitamin A, an important nutrient responsible for restoring and maintaining melanin in the skin. Animal-based foods that contain vitamin A include whole or skim milk, cheese, eggs, and beef or chicken liver.' I will say I do eat some animal-based foods, but I do not eat meat because I am a vegetarian, so I need to find foods accordingly. I will admit that my one downfall is junk food though, and my chai tea mixed with sugar to wake me up in the mornings when I feel super tired, but I typically only try to do that on occasion. My father had vitiligo on his wrist, my nephew has it bi-laterally on his knees (brother's side of family), and my niece from my husband side of the family has it on her knees and thigh area too. I noticed my two year old started getting patches on his feet. My husband thought that his feet were dirty but I noticed it right away. Today he's 6 years old and it has spread to his knees, he has patches on his wrist and knuckles, some areas on his bottom and big areas on his groin. He also has patches on his chest, under his armpits and around moles. I even notice it in his eyelids. He is so handsome. Kids are always asking him what's wrong with his skin. He is so innocent, he replies, 'nothing is wrong!' He has vitiligo and if someone ever tries to make him feel he's different, that someone is insecure of themselves! Your imperfections are beautiful and that's what makes you who you are! Accept it! Embrace it! That's what defines you. The vitiligo started when I was 9 years old. My ankles started itching and I started scratching. Then I noticed small white spots on either side of my ankles. I tried to hide it from my parents and failed. Off to the doctor"s we go. Next thing I know I get the same prescription for a hydro-cortisone cream my mom had for liver spots! Later on my Mom explained to me that, "there is a bug under your skin eating away the pigment." Lucky for me, 4 years later the news broke about Michael Jackson, so I finally had an answer to all the "Were you burned? Car accident? Scars?" questions I loathe. I am affected with vitiligo on both eyelids, armpits, wrists, hands, ankles, top of feet, inner thighs, stomach, and genital regions, my scalp in spots prompting me to dye my hair since I was 14, and the back of my neck. I have never consulted a doctor as an adult and simply dealt with it by avoiding sun exposure and sandals, etc. My youngest son has had vitiligo since he was 2 or 3. We did not know that was what it was called and I really don"t think any doctors had ever called it by name until he was in his teens. Of course, the doctors said there was no treatment and that it was just where the skin had no pigmentation. He has always been a very handsome boy, and it has never bothered him. He has had people ask him, but he was always so outgoing that it never occurred to the other kids to tease him. He is now a freshman in college and playing college football. After seeing this site I asked him if it ever bothers him, and he laughed and said no. I have read some other peoples stories and it made me sad to see how negative this has affected their lives. My advice to them is, don"t let others put you down, turn it around on them and make it into a joke. It is what is in the inside that will shine out, and that is what people will see. I have tried homeopathy, allopathy and many things for vitiligo. The only thing which I have understood is it is purely untreatable, but still with proper diet, psychological balance we can notice some changes. I was shattered with the appearance of white patches on the corner of my mouth and limbs. My family doctor then told us that this condition was called vitiligo or leucoderma. Being a professional model, my confidence was crippled and I thought that it meant an end to my career. I tried almost everything - corticosteroid cream, calcipotriene. I was dismayed to find out that the results of these lasted for no more than 4 months! Besides, the relapse was worse than the first spell. I was only hesitant to try the topical psoralen plus ultraviolet A (PUVA) therapy, for I was warned that it could lead to sunburn, abnormal hair-growth, darkening of treated patches and the normal surrounding skin. The search for a lasting cure drove me from pillar to post. Exhaustive surfing led me to Vitiligease formula. Patience had to be my modus operandi and I took its entire 4 months course. I was relieved to see a marked improvement in my skin condition. About 6 to 8 months ago, I thought it was some clean patches of skin showing through the grime I'd had accumulated all over my body by not showering for the previous 4 months. I developed concerns only after a friend pointed it out last week. Please understand that I am not at all being frivolous, only candid and I have an appointment with my general physician tomorrow. I am also an alcoholic by the way and my urine and blood report say that I pass proteins in my urine and have a very low white blood corpuscle count. It says here that most patients show the symptoms of vitiligo before they are 40, (the pattern in my case is general (symmetrical on both sides of the body), I wonder if there is a chance that it could be something else because I first showed the symptoms at 52 years of age. Also, for those who feel stigmatized by it, remember, it's no big deal, live life to the fullest. The patient is my wife, she is 57 years old. The white spots started appearing on her legs as very small spots. They have now progressed to half-dollar size and remain in the region of her thighs up to her stomach where no one knows that they are there except her and me. She is being nonchalant about it but I have concerns that it is starting to spread more rapidly but she refuses to see a doctor about it which is why I am on this website to get more information about vitiligo. When I first noticed the skin discolorations, I thought my teenage tormentor had returned, tinea virsicolor. Vitiligo, still very new but has been fast moving, diagnosed with Pernicious Anemia almost a month ago. Had told my sister, prone to autoimmune diseases, 15 years ago diagnosed with Graves Disease. Radioactive Iodine left me hypoactive. After my pcp confirmed not tinea virsicolor, I immediately thought of Michael Jackson and others I had seen with vitiligo. My vitiligo was diagnosed at age 70. I went to the usual doctors, heard the usual stories, and at my age, decided it's not going away. It's not going to get better and now it's a part of my life. My husband of 56 years understands what happens to the body as we age. Some people are lucky and others are not. Don't spend your money on make-believe cures or stories.